8 Kilos of delicious long grain enriched rice. This bag will keep a medium sized family well stocked with the very best long grain rice available. 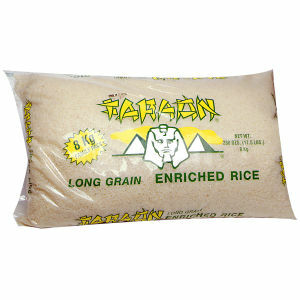 Faraon uses only the very finest crops available to pack its rice. Rice is our business and we are proud to serve only the finest to our loyal consumers. Only rice that has been mostly naturally irrigated by rain water goes into our Faraon bag. This assures the perfect humidity balance that will keep you coming back for more.